Every night at 8 pm is a big ballroom dancing night here in Coconut Creek. Some are a good mix of Latin-American Dancing and Ballroom Dancing, some other nights can be only Salsa or Tango or Swing Night. 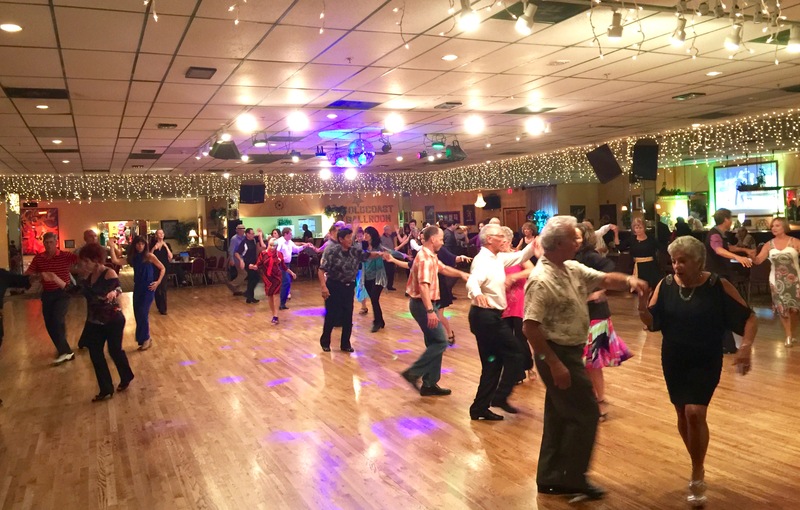 No other ballroom dance studio in Fort Lauderdale and Pompano Beach today attracts 200-300 ballroom dancers every night 6 days a week. Our followers are traveling here to Coconut Creek from as far as North Palm Beach, Jupiter, Homestead and Weston. Have been dancing for about 5 years (started at Arthur Murray) and find that Alex really takes us to a new level. He teaches American as well as standard. From making sure that our basic technique is correct, to teaching us new steps, we have learned an incredible amount. "We are greatful for your skill in teaching us Wedding Dance so quickly...The guests were so impressed." Purchase a Gift Certificate for yourself or a friend. Ballroom Dancing offer the most benefit in reducing the risk of developing dementia by a whopping 63 percent. Don't wait another minute! Call (954) 980-9777 and sign up for the Ballroom Dance Program. Reduce your risks of getting these health problems while having fun! - We email you the validated Certificate - you print it. What make us special? Our most experienced instructors know how to make you dancing in no time and look great. Beginner's Discount from the world class dance instructors. Largest ballroom dance studio in Pompano Beach and Fort Lauderdale area. Best deals on Wedding dance lessons. Learn how to look and move like prince and princess, impress your friends! We are world class experts at your feet. Proud to serve Coconut Creek, Coral Springs, Margate, Parkland, Tamarac, Pompano Beach and Greater Fort Lauderdale area. Learn to dance the easiest and most popular of 5 Salsa styles, the Salsa On 1. So easy, we'll have you dancing after only 5 lessons! The most experienced instructors in Pompano Beach will make you a star in no time. Do not hesitate to ask about huge Summer Discount for all Salsa lessons! Jose Ruiz made the final on "So You Think You Can Dance." Click to see how you too can dance after 10 lessons. We choreographed First Wedding Dance to their favorite song. Surprise your friends and relatives and show them how elegant and graceful you can be! May and June are the Best Deal time. Demand for huge discount! 30 min. New customers only.